70% of organizations say that efforts to transform the business are undermined by internal complexity, including legacy technologies and a lack of collaboration between the business and IT. Business functions can’t wait months for solutions, but IT leaders must to retain oversight to prevent digital projects from spiralling out of control. 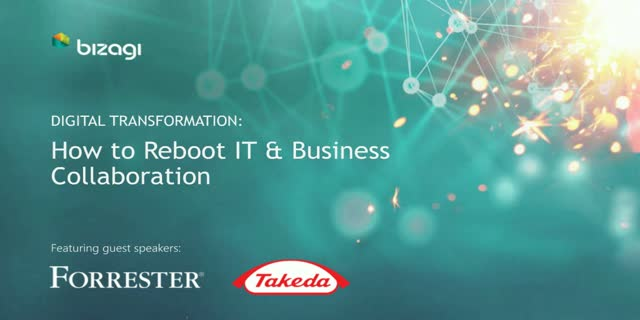 Join this interactive webinar to hear how Takeda Pharmaceuticals has used a Digital Business Platform to rapidly build agile applications approved by IT, but owned and customized by the business teams that use them – unlocking benefits that would be attractive to any organization. Importantly, you will have the chance to ask your questions about all of the above. We all know that automation is critical to digital transformation. But what is the difference between BPM / DPA and RPA technologies? How do they fit together? Join Bizagi, a leading provider of Digital Process Automation, and UiPath, the leading global enterprise Robotic Process Automation (RPA) company, for practical advice about how these technologies combine to help you enable enterprise-wide digital transformation. The webinar will be hosted by Bizagi’s Nitish Pargal, Brandon Brown of UiPath and our guest speaker Craig Le Clair – VP and Principal Analyst at Forrester Research. At Catalyst 18, our annual international conference in Miami, Bizagi made some key announcements about the future of its products and services. This is your chance to learn more about those announcements with the Bizagi team and exclusive news shared at the event. Robotic Process Automation carries huge opportunities to deliver business agility and powerful results by freeing people from performing repetitive tasks. Learn how RPA and Bizagi help unlock operational efficiency and drive practical value by incorporating them in your business operation. •Examples of how businesses can use RPA and Bizagi today. How do you introduce Blockchain technology into your business? Watch and learn how to orchestrate Blockchain and Bizagi in minutes utilizing our Global Xchange, an extensive set of free ready-to-use connectors, widgets and process templates available when you want it. •Our most popular ready to download Xchange connectors, widgets and process templates. Webinar dirigido al sector de Telecomunicaciones donde contamos con la participación de Mónica Di Paolo Gerente de Proyectos, Procesos y Tecnología, Victor Claverie Jefe de Implementaciones Corporativas de FiberCorp, Personal y Telecom. Quienes a través de su experiencia nos contaron los retos de la Transformación Digital en el Sector de Telecomunicaciones y cómo superarlos. Watch and learn how to use the powerful Bizagi business rules engine to define and manage your complex business rules easily and intuitively. Learn how monitor and continuously optimize business processes and turn process information into business strategy. Are your processes compliant by design? Watch this webinar hosted by AgFirst, the largest agricultural lending organization in the United States. Watch now or block some time later today to hear Kevin Backus and Chris Miller explain how they use Bizagi to design and automate critical processes with compliance in mind. Learn about how Bizagi manages all types of work processes (cases) whether structured or unstructured in a goal-orientated fashion. Watch now and learn how to use the Bizagi Reporting and Analytics platform that allows you to monitor and continuously optimize business processes. Digital disruption has come to insurance. And it’s being driven by digitally-empowered customers. Insurers need to adopt business and operating models that are more customer-focused, more collaborative, and more responsive in order to compete with the insurtech digital upstarts. Learn how Bizagi can help you gain business insights by allowing users to easily abstract and consume process data across your operations. •Use Datasets to expose process information to business users. •Expose data in legacy systems via data virtualisation through the Bizagi API. •Implement using RESTful and OData services. Learn how Colombian Bank Bancolombia manage to drive efficiencies across their business. •Help improve day to day business operations. •Build processes right from within your browser. •Quickly implement new applications for any business need. Watch a demonstration and learn how using Bizagi Live Processes can help improve day to day business operations, build processes right from within your browser. and quickly implement new applications for any business need. Who should attend: Digital Technology Leaders, Application Development Leaders, IT, Business and Process Professionals. For Digital and operational leaders, there’s a tension between the demand for agility and the pressure to maintain compliance with global regulations. How can you reconcile these competing corporate goals? Who should attend? Digital Technology leaders, Application Development Leaders, IT, Business and Process Professionals. Gain practical insights from experts on the critical role of agility in digital transformation. In this session, we will discuss how conservative and low risk cultures can be quickly replacing agile methodologies and rapid experimentation. •Where should change come from, top down or the ground up? •What results have agile solutions delivered for Manpower Group? Learn how to use Bizagi to build highly personalised processes to meet your customer needs. •Use data, content and context to enable organizations to quickly define smart and unique offerings. •Easily define context for a product or service. •Create highly personalised services with no coding needed. Watch a demonstration of an end-to-end loan application built with Bizagi. See how you can deliver a seamless customer experience across multiple channels – both from the perspective of your customers and your employees. immediate business agility and process orchestration required to compete in the digital economy.